Long Beach, CA - Rouchon Industries, Inc. dba Swiftech® announced today the release of the Maelstrom 5 ¼” Dual Bay Reservoir. 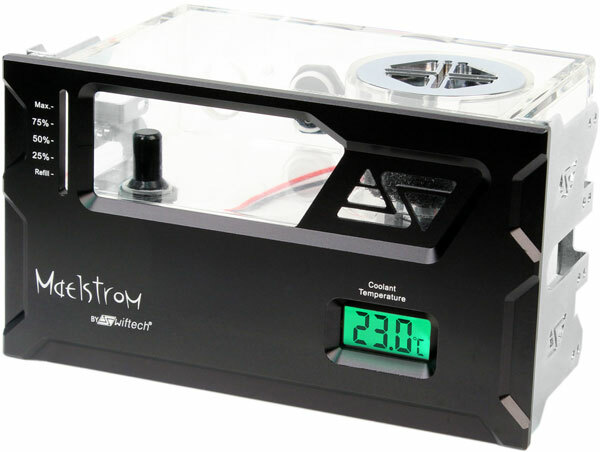 The product is modular and can be configured to operate either as a standalone coolant reservoir or with one or two integrated Swiftech’s MCP35x class pumps, all fitting in a dual CD drive bay. The primary design concepts for this product line were modularity and compatibility with the MCP35x class pumps and their related accessories for upgrade purposes. Continuing the company’s long established tradition, the Maelstrom also includes a host of monitoring and operational safety features which combined together form a unique offering in the industry, such as: coolant temperature display, graduated level, anti-vortex design, multiple inlet ports, extra-large fill-port, and UV LED; its robust and elegant construction features a solid black anodized aluminum face plate with large cutouts allowing easy visualization of the coolant status. Five versions of the Maelstrom reservoir are available, including standalone, with single or dual built-in pump, and two upgrade configurations for users already owning compatible Swiftech® pumps. Swiftech offers a wide variety of advanced air and liquid cooling solutions for the IT industry, and is working with leading OEM’s, semi-conductor and PC manufacturers as well as a network of over sixty leading distributors worldwide. The principal business of Swiftech is the development, manufacturing, and sales of thermal management products. They are divided into three categories of cooling products: air, liquid, and thermoelectric. Because Swiftech products have garnered innumerable industry awards in each one of these categories, the company has acquired the confidence of its customers, small and large, to resolve today’s most acute thermal management issues, and contribute in shaping the future of the personal computer cooling industry. You can visit Swiftech’s website at: http://www.swiftech.com. Or you can email us at: info@swiftech.com. Allied Electrical is the company manufactures and indirectly exports CP and CPM Coolant Pump Manufacturers, which are an immersion type Centrifugal Pumps. The primary objective of these pumps is dissipation of heat from the work piece and the cutting edges.